So I've just purchased Notion 4 and I'm trying it out. I specifically need it to create piano sheet music of pre-recorded midi data. I've run into two problems already with no obvious solution to be found in the manual. I'm importing a fairly complex jazz piano midi file from Reason 7 and the piano roll in Notion looks great and the playback plays correctly, but when I convert it to notation, it shows sixteenth notes as chords instead of individual notes. It plays them back correctly though in notation mode. Any thoughts? The second issue is that when it imports the midi file, it puts both left and right hand parts on the treble clef. how do I move the notes that should be in the left hand to the bass clef? Do I do this in piano roll? Or after I've converted it to notation? I can't figure out how to select only the bottom half of a measure without selecting all of the measure and I also can't figure out how to copy notes from the treble or move them from the treble to the bass clef. Any help is much appreciated!!! The primary problem is that there is no one-to-one mapping of MIDI to music notation, and the consequence is that the conversion from MIDI to music notation is done with an algorithm which by necessity needs to make arbitrary decisions . . . In contrast, MusicXML is very precise for music notation, but Reason 7 does not export in MusicXML format . . .
(1) Try temporarily changing the tempo in Reason 7 before exporting the MIDI, where the hypothesis is that by using a very slow tempo this will make the distinctions between otherwise rapid and adjacent notes easier to recognize and to map to music notation, noting that after doing the "Export MIDI" with the significantly slower tempo (BPM, if you prefer), you can set the tempo to its normal value . . .
(2) Instead of exporting the MIDI from Reason 7, this strategy is based on recording the Reason 7 MIDI for the piano to a NOTION 4 Piano grand staff; and this uses the new Reason 7 External MIDI Instrument, which makes it possible for Reason 7 to play external instruments via MIDI . . .
You will need to configure Reason 7 to use an External MIDI Instrument to send the MIDI for the piano to NOTION 4, where you will record it to a native NOTION 4 Piano grand staff . . . The advantage of doing it this way is that you will have more control over the various parameters that apply to recording real-time MIDI in NOTION 4, noting that this includes being able to specify the "Split point" for the grand staff . . . I have been intrigued by the possibility of doing (2) for quite a while; and as soon as I read about the Reason 7 External MIDI Instrument (EMI) I was comfortable writing about it, but writing about something is different from doing it, hence to verify that my intuition was correct I did some experiments this afternoon, and I was able to record MIDI sent from a Reason 7.1 External MIDI Instrument to NOTION 4, thereby confirming that my intuition was correct . . . However, it did not work the way I thought it worked, so I am doing more experiments to determine the rules . . . Specifically, I thought it would need to be done in a ReWire 2 session using a "virtual MIDI cable", but so far I have not discovered how to do it that way . . . Instead it happens quite automagically in a way that makes nearly no sense to me, but so what . . . I do everything on the Mac, and stuff happens automagically on the Mac . . . It will require a few more experiments to make sense of the way it works, but (a) it definitely works and (b) as tends to the be case, the various documentation not only is no help but also is quite confusing . . . Explained another way, (a) software engineers think differently from so-called "normal" people and (b) technical writers nearly always are "normal" people, hence the disconnect . . .
My strategy, which in part is based strongly on being a software engineer, is to determine by various methods the mindset of the respective software engineers when they were designing and programming the technology I am exploring . . . If I can determine what they were thinking at the time, then everything will make sense . . .
For example, they might have been mesmerized by watching metal balls bounce back-and-forth on a Newton's Cradle during the team meeting when they had the idea for the External MIDI Instrument, and once you know this, all you need to do is imagine yourself watching metal balls bouncing back-and-forth, and then there you are: Everything makes sense; you understand all the rules; but most importantly, you do not need to read anything, hence can continue to be unencumbered by knowledge . . . I need to do a few more experiments to determine the rules applying to Reason 7 External MIDI Instruments with respect to sending MIDI to NOTION 4, where NOTION 4 then records the MIDI to a native NOTION 4 Piano grand staff, but (a) this definitely works and (b) I think it will provide more control over the way the MIDI is mapped to music notation by NOTION 4 . . . I'm not sure how to fix the chords/16th note problem but as to the left hand/right hand, this is best fixed in Reason. Create a second track on a separate MIDI channel. Cut the left hand notes from the original track and paste them into the new track and export the MIDI file as Type 1. Notion will import it as two separate instruments, but you can then easily cut and paste it into one. I think I was mesmerized by the bouncing metal balls . . .
After taking a break for a while, I did another experiment and followed the intuitive procedure, which worked as expected . . .
Did it matter that I was wearing an Hawaiian shirt and enjoying a happy beverage? Perhaps, if the team meeting was on Hawaiian shirt Friday and the algorithm was written on a cocktail napkin . . .
None of this stuff is documented, and the only strategy that works for me when I need to discover how something like this works is to "Be The Ball", so to speak, which is a Zen thing . . . I am going to do a few more experiments, one of which will be to lower the tempo, but the YouTube video (see above) is verification that the second suggested strategy works, and as you can see it does the split correctly, where in the YouTube video the "Split point" was set to "Middle C", which is C4 in scientific pitch notation for the US . . . The succinct version is that you create a External MIDI Instrument (EMI) in the Reason 7.1 song and then copy the piano or keyboard MIDI to the newly created EMI lane . . . The ReWire 2 session begins by starting NOTION 4 first when nothing else is running, which makes NOTION 4 the ReWire 2 host controller. Then you start Reason 7.1, which makes it the ReWire 2 slave . . .
With the various preferences, parameters, options, and so forth set correctly, the MIDI is recorded in NOTION 4 via its MIDI Record feature, where the key is to select the NOTION 4 staff to which you want the MIDI from Reason 7.1 recorded, noting that in this scenario the NOTION 4 staff needs to be a grand staff, and the native NOTION 4 Piano is a logical way to achieve this goal . . . When I was investigating this yesterday, I tried so many different things that by the time I found a way to get it working I had no idea what I was doing, and the strange aspect was that I found a way to do it outside of a ReWire 2 session, where I had Kontakt 5 running in standalone mode and NOTION 4 also was running in standalone mode, since I started it after I started Reason 7.1, which is the case because Reason 7.1 only functions as a ReWire 2 slave, hence when it is started before an application which can run as either a ReWire 2 host controller or a ReWire 2 slave, that application (NOTION 4 in this instance) becomes a ReWire 2 host controller but does not recognize Reason 7.1 as a ReWire 2 slave, which makes sense if you understand ReWire 2 and think about it for a while . . . Strange is it might be, this actually is a variation of the way you can record MIDI in real-time to NOTION 4 and Studio One 2.6+ Producer/Professional, where they key is that the "Record" buttons on both transports are pressed manually, because recording in NOTION 4 does not put Reason 7 into record mode . . .
ghess1000 wrote: I'm not sure how to fix the chords/16th note problem but as to the left hand/right hand, this is best fixed in Reason. Create a second track on a separate MIDI channel. Cut the left hand notes from the original track and paste them into the new track and export the MIDI file as Type 1. 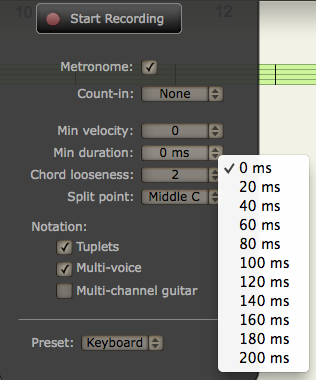 Notion will import it as two separate instruments, but you can then easily cut and paste it into one. What an obvious solution!! Wasn't thinking that way - thanks!! Surfwhammy wrote: I think I was mesmerized by the bouncing metal balls . . . I'll give this a try. I'm on a pc but running LoopBe30 and have everything set up to use Reason's MIDI out on other stuff. I'll report once I have time to debug. I thought, that possibly quanitizing in Reason -- though it would destroy the performance's feel -- might help Notion separate the chords/16ths issue as I am pushing and accenting some of the notes on purpose when I play. I'll report here my discoveries... Thanks for the reply and suggestions!!! miahluvdd wrote: I'll give this a try. I'm on a pc but running LoopBe30 and have everything set up to use Reason's MIDI out on other stuff. I'll report once I have time to debug. I thought, that possibly quanitizing in Reason -- though it would destroy the performance's feel -- might help Notion separate the chords/16ths issue as I am pushing and accenting some of the notes on purpose when I play. I'll report here my discoveries... Thanks for the reply and suggestions!!! QUESTION: Can you post or PM a few measures of the MIDI exported from Reason 7 where the notes play correctly but appear bunched or blurred when converted to music notation? If so, then I can do some experiments toward the goal of determining if there is a way to manipulate the NOTION 4 recognition algorithm to improve the accuracy of the MIDI-to-notation transformation . . . Since the piano already is recorded as MIDI in Reason 7, I like the idea of using a much slower tempo when you are sending the MIDI from Reason 7 to NOTION 4 to record it in NOTION 4 as MIDI . . . This is a variation of the way I transcribed lead guitar solos "by ear" when I was teaching myself how to play lead guitar, and it might work the same way, noting that I already knew how to play bass guitar . . . If you play a record at half speed or slower, then the lead guitar notes sound like bass guitar notes, and they are slower, of course, which then makes it easier to hear and to identify the very rapid phrases . . . If the tempo is halved, then the notes are the same but an octave lower and half as fast, so it is like a peppy bass guitar solo . . .
Once the notes and phrasing were identified, I would practice it over and over on lead guitar and gradually increase the tempo; and then after a while it was easy to play . . . Instead of playing a peppy bass guitar solo, I was playing a lead guitar solo note for note at the correct pitch and tempo . . . The first few lead guitar solos I learned this way took several months each, and they were perhaps 30 seconds long . . . The reason it took so long was that I had to develop the finger dexterity and upper body strength required to play lead guitar, as well as to develop the auditory skills required to make sense of rapid phrases at higher octaves, which basically is what maps to learning how to play lead guitar, along with memorizing a catalog of standard phrases and other stuff . . . The MIDI is recorded in Reason 7, but it has not been recorded in NOTION 4, so (a) recording it in NOTION 4 is a second opportunity and (b) using a slower tempo increases the differences in the timing of notes . . . In other words, I think there is a margin of error or range in the recognition algorithm for each type of note . . . The faster the tempo, the smaller the margin of error or range, which in turn causes rapid notes to blur rather than to be distinct when they are represented in music notation . . . The key to this hypothesis is the fact that there is no one-to-one mapping of MIDI to music notation . . . I would expect the resulting MIDI to be identical, but not so the music notation, because the conversion or transformation from MIDI to music notation is inexact, hence there probably is a bit of "wiggle room", and the hypothesis is that slowing the tempo provides more "wiggle room", which in turn maps to better precision in the conversion or transformation algorithm . . . I gave up on importing MIDI files into notation software years ago. As you know, music can be interpreted differently by different listeners. Transcriptions can be written very different. There's more than one way to notate a given piece of music. File conversion from SMF (Standard MIDI File) to music notation almost deserves the "apple to oranges" description. Rather than importing your piano work IMO (I'm sorry to say) starting over from scratch is a better option and you will avoid quickly running out of editing options. It would be a dream come true if Notion had better editing features that allowed note events and other objects to be unlocked "unquantized" to allow them to be freely repositioned and latter locked "converted to music notation" again. SMF display well on piano-roll graphical interface; however, conversion to conventional music notation will likely always produce lackluster results. There's just so many variations in interpretation. I've tried both importing and direct recording via Rewire into Notion 4 from Studio-One with neither method producing favorable results. Heck if you can't record it real-time why would importing be any different. It's just not that easy. I used a SMF of piano great "Fats Waller" which sounds absolutely great played back in a MIDI player/sequencer. In Notion the imported file looked better IMO than the rewire real-time recording. They did not look identical. Yes, there is the option to change the real-time record settings; however, that only seems to smear the data around. Again, some small variation in the interpretation. Not much though. The suggestion or idea to record at "slower tempo" or save and export the SMF at a slower tempo simply will not produce better results IMO. It just does work like that. Again, to transcribe a musical idea I've found it more productive and enlightening to start from scratch as opposed to import. I was quite frustrated at first yet I now except the limitations of the conversion process. There just isn't enough editing features at this point to get the results needed. P.s. I sometimes use an SMF or an Audio sound file imported to a staff as a listening reference to help recall an idea. Then mute it on the mixer after I've heard a part. Also, if your original import has tempo change I may use it and only delete the notes. Importing MIDI files is likely to produce errors, but I've found Notion to be much better at it than other notation programs. I'm not exactly sure how, but it seems to get rhythms such as staccato quarters rather than eighth note/rest right more often than not. It really depends a lot on the MIDI file itself. A sloppy performance or very complex notation will not be very good and starting over might be the best choice there.